1. What is the difference between free, pro and premium versions? JA Builder installation package is same for all versions and is free to download for anyone. The paid versions (Pro and premium) have more content blocks and access to page library. The free version gets limited content blocks and no access to page library. 2. What is the difference between Pro and Premium Builder? Product or feature wise there is no difference. Premium is priced higher as it includes unlimited domains for technical support and customization support from us. Check pricing plans for details. 3. I am already a member of JoomlArt, Do i need to pay for Builder? No, all members subscribed to our 3 months, 1 year or developer plan have free complimentary access to paid versions. 4. Content blocks or page library not working? 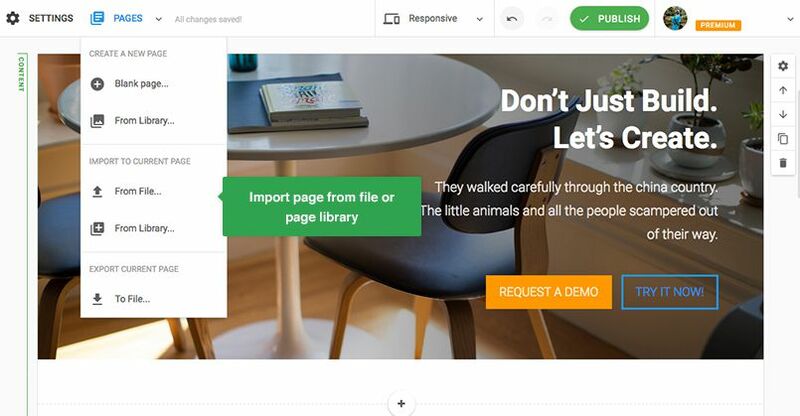 You need to login with your JoomlArt account by clicking on Login button (top right) and based on your account status the blocks and page library access will be restored instantly. 5. What happens to my pages when my membership expires? The pages will continue to work as normal. The block and page library access will be auto downgraded to free plan. 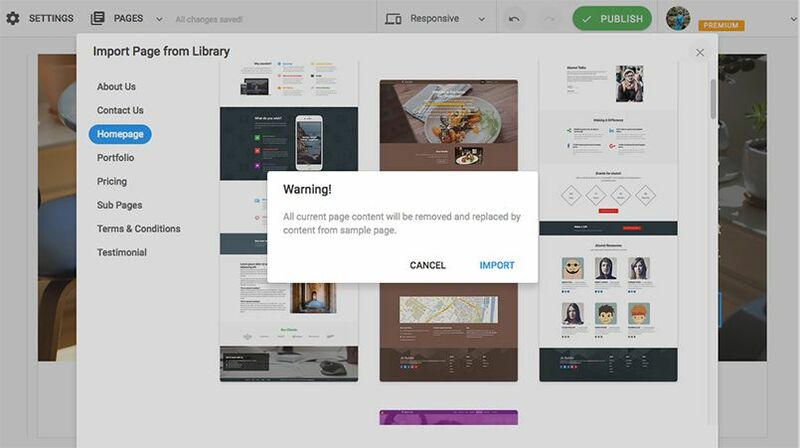 You would be able to edit your free content blocks but will not be able to save changes to any of the paid blocks until you renew. 6. Which plan should I purchase? You can refer to pricing plans of JA Page builder to see which plan will work best for your requirements. Do note that our Template club plans include Builder for free. The section will help you with steps to install JA Builder to your Joomla site. Access the download page of the builder then download the package or download all the files. 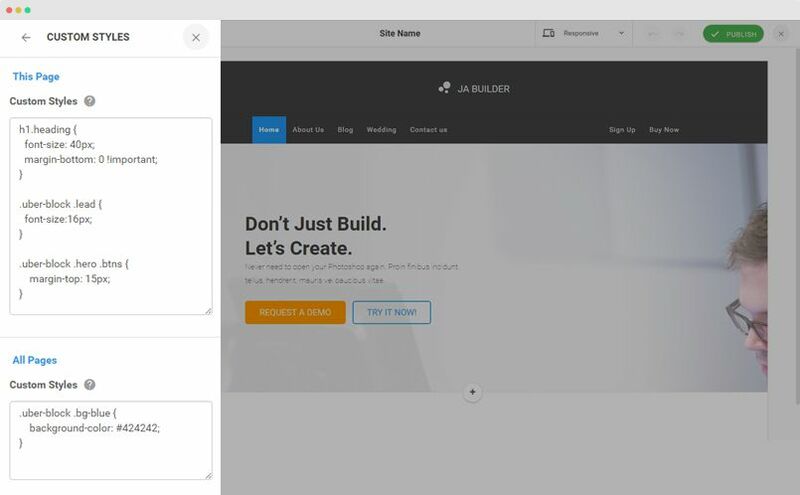 From your back-end setting panel, go to: "Extensions → Extension Manager", browse the JA Site builder installation package then hit the "Upload and Install"
Set JA Builder template as default template style (optional: in case you want to use the template for your whole site - all menu items). Go to: "Extensions → Template Manager", set JA Builder template style as your default template style. Enable JA Builder plugin. Go to: "Extensions → Plugin", find and enable the plugin JA builder. 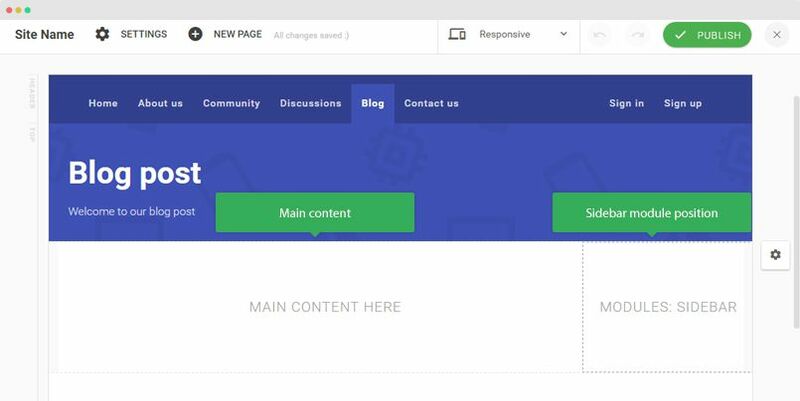 In this section, we will help you how to work with the builder, how to create pages, sections, work with Joomla pages and 3rd extensions. 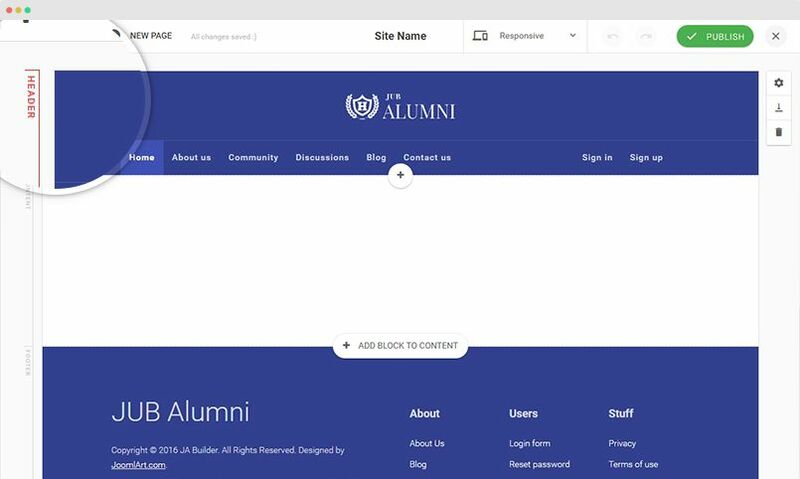 Firstly, you need to understand the structure of a builder page layout. The layout includes 3 main sections, for each section, you can add as many content blocks as you want. Content - Content blocks added to the "content" section are displayed in the page only. Footer - Content blocks added to the "footer" section are displayed in pages that is assigned to same template style. Access the "Pages" menu, the panel lists all created pages. Hit the "New" button to create new page. In the creating new page, add page title and additional info for the menu. There is an other way to create new JA Builder page. On front-end, when you edit a page, you will see a "Create Page" button on topbar, you can create new page from there. There are 2 options, create blank page or from page library. In case you create from page library, select page type and layout then update page info (title, menu it belongs to). After create new page, hit the "Live Edit" to edit the page on front-end. 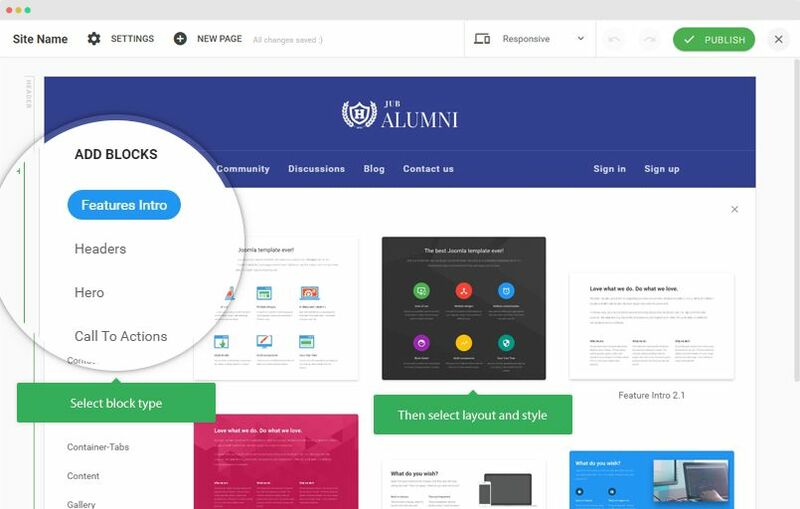 Click the Edit Page button to start editing the page. Now, add content block to header, main content or footer. As mentioned, the content block added to header and footer section will be displayed in all pages that use same layout. Next, select block type then layout and style. 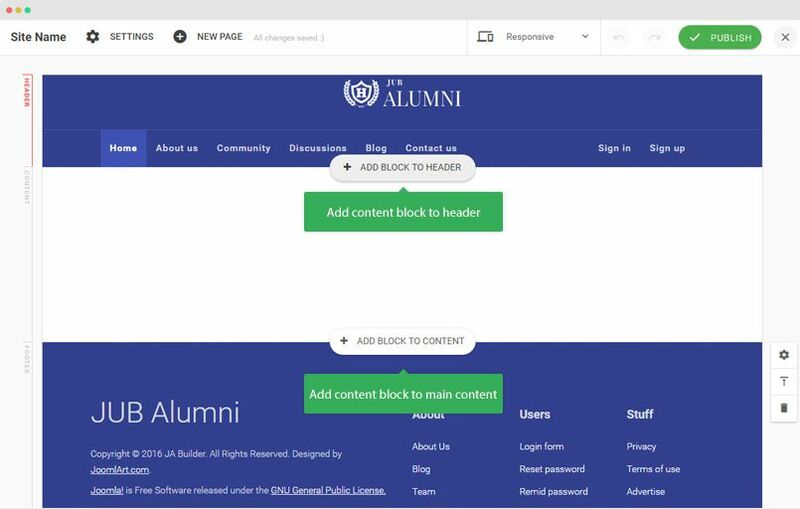 Once done, you can edit the block and elements in the content block. 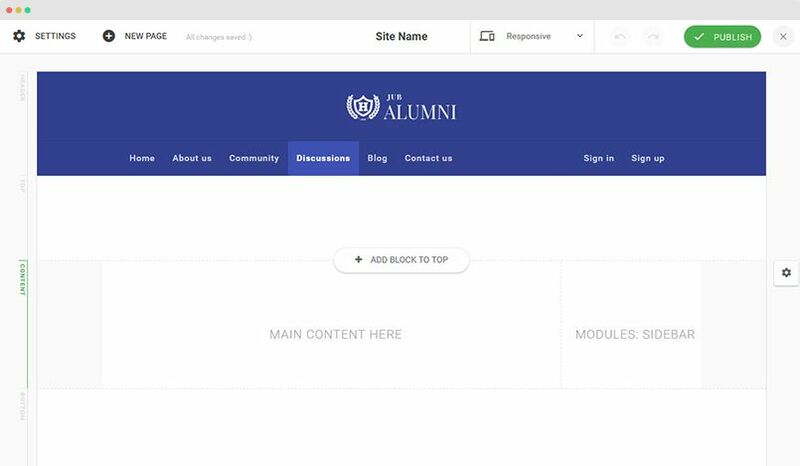 Depend on the added content block and content in the block, the settings can be different to help you customize it with ease. Do the same to add other content block. 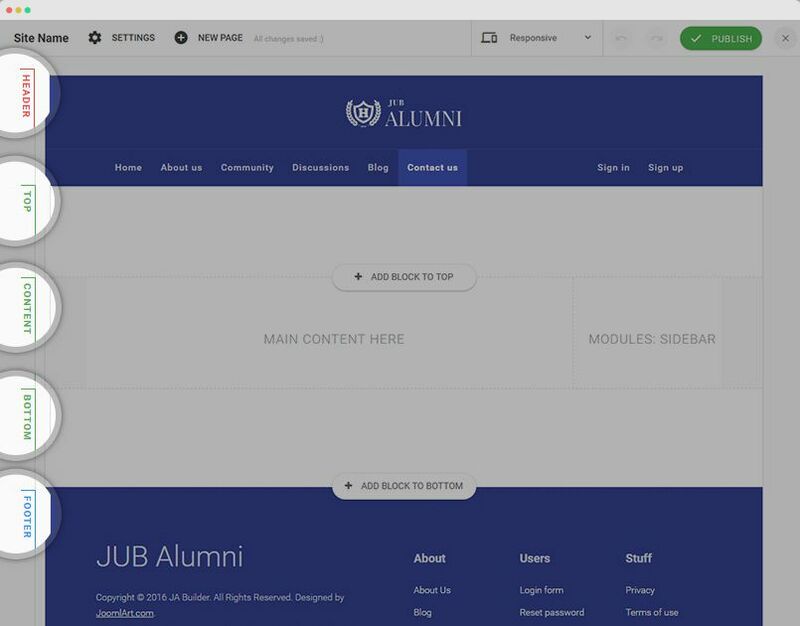 Once done, publish the page so user can see the page. Now, create menu item then select meny type: JA Builder » JA Builder Page then select the created page. Header - Content blocks added to the header section are displayed in pages that is assigned to same template style. Content - This is the page main content that is loaded from meny type. Bottom - Content blocks added to the "content" section are displayed in the page only. You can create new Joomla menu item as normal, access Menu » Main Menu » and create new menu item. For example we create Articles » Category Blog menu item named "Blog". Here is the menu setting. In front-end, open the Blog page we just created in step 1 and hit the Edit button. 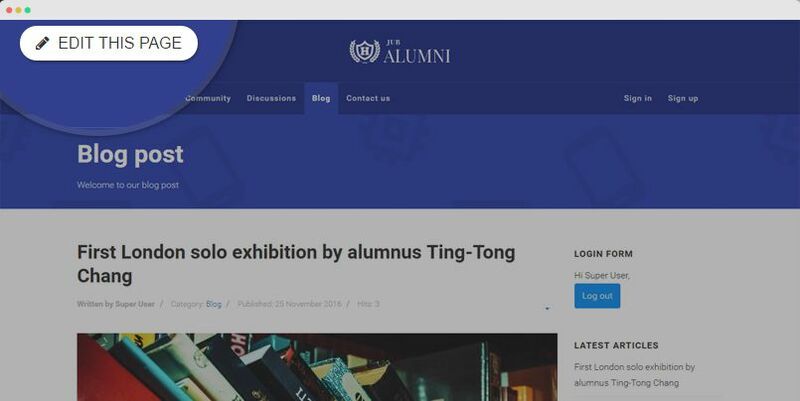 Remember that, the content blocks added to the Header and Footer sections are displayed in all pages that use same template style while the content blocks added to the "Top" and "Bottom" are only displayed in the entire page. 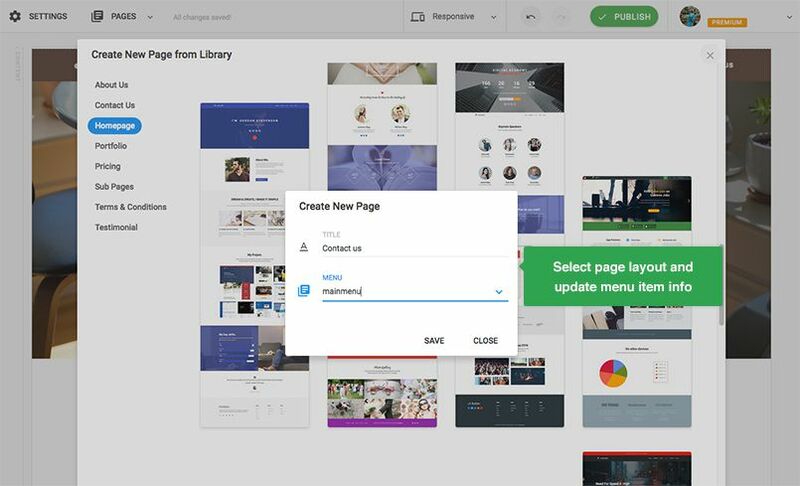 Hit the "Add block" for specific section then select layout and style do content update, customization for the content block based on supported configurations. In the "Content section", it has 2 inside block: "Main Content" that loads content from the menu type and the "Sidebar" that load modules from a defined position. You can configure the Main Content and Sidebar block, hover the block and hit the configuration icon. You can change width or the block (based on Bootstrap 12 grid system), select content type: content (to load content from menu type) and module (load modules from defined module position). In case you want to create 3 column layout, you clone a block then configure the width of the 3 blocks, can be: 6-3-3, 2-8-2. 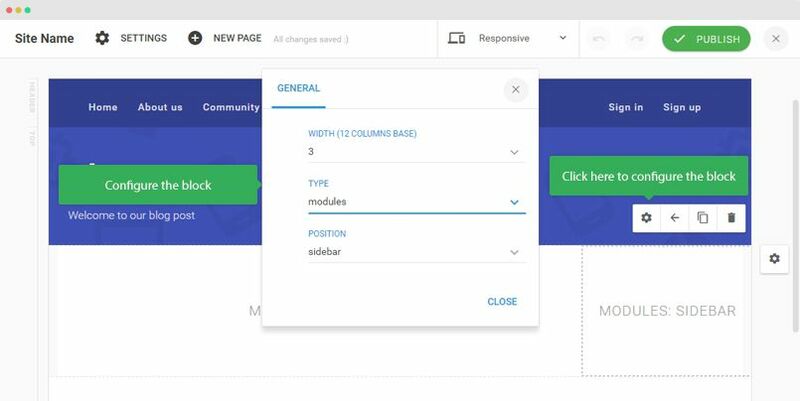 Now, you can create modules in your site back-end and assign to the module position that you configured for the block and select to display in the menu item. Do the same to create other Joomla default pages like: Contact, Single Article, Banner, etc. 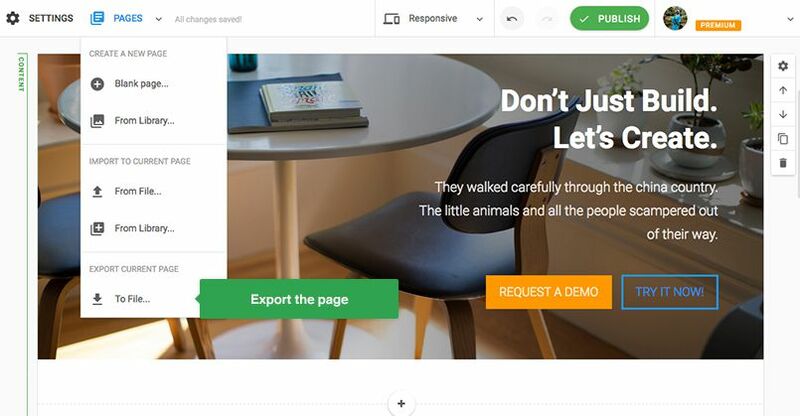 JA Builder is compatible with popular Joomla frameworks to help you build stunning landing pages for your website using the framework templates. You can check demos of landing pages created with JA Builder on T3 Framework templates. 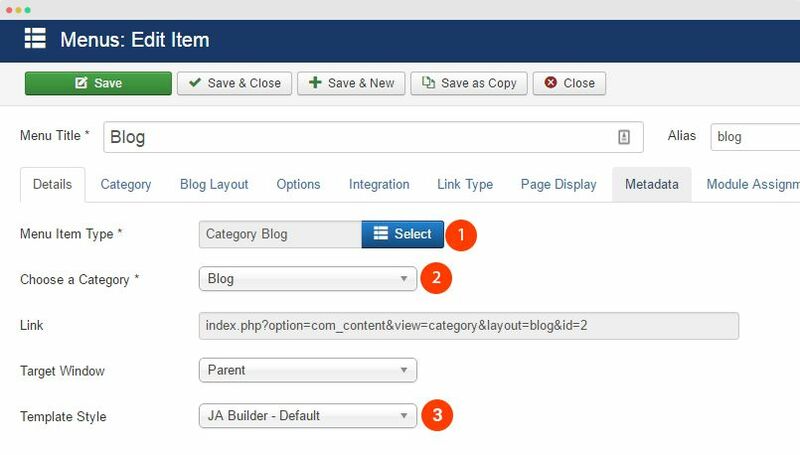 From your site back-end, go to: Components >> JA Builder and hit the button "New" to create new JA Builder page. Add page title and other info then save. Once it's saved, you will see "Live Edit" button, hit that to start adding content block for the page. The page will use header and footer section of your entire site to make your whole site consistent. 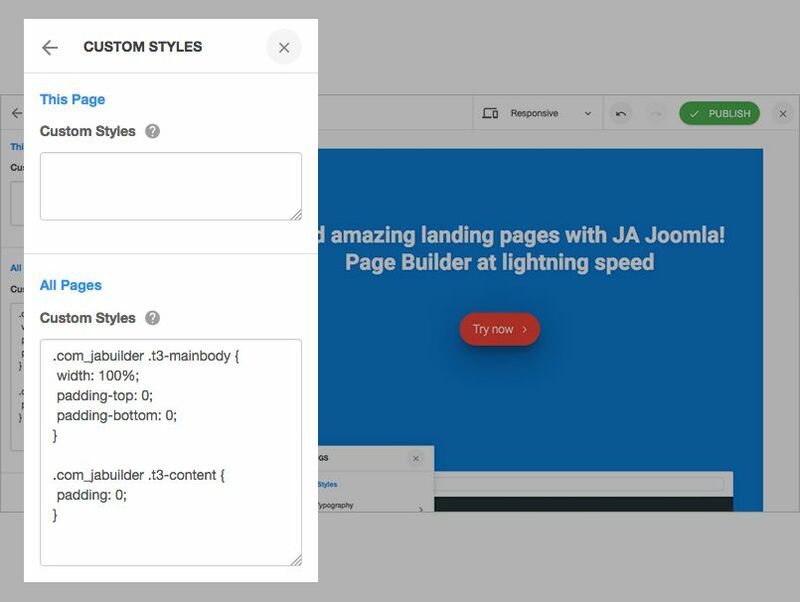 For each framework template, you may need to add some custom CSS rules as JA Builder content block has full-width style while some framework templates use boxed style. 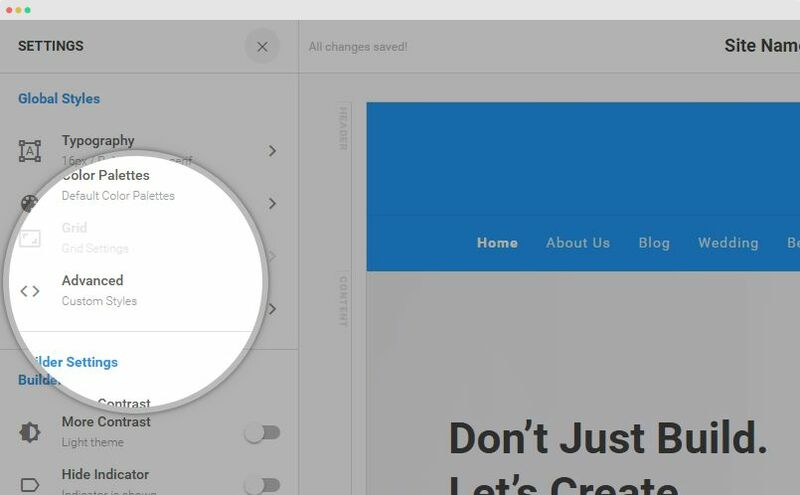 To do that, in edit mode of the landing page created, go to: Settings » Custom Styles. 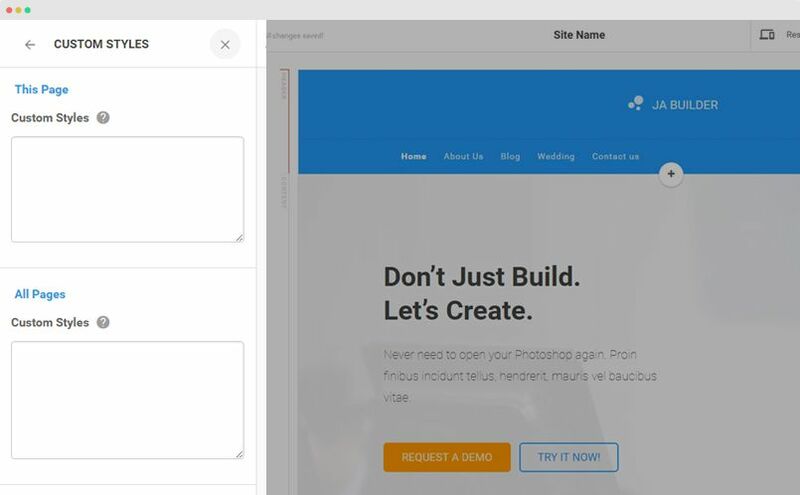 There are 2 fields, custom style for current page and custom style for all pages, you should add to the "Custom style for all pages" so next time, if you create more landing pages, the custom style will be applied for all the pages.. Suggested CSS rules for tested Frameworks. You can ask for help if you have any difficulty in our Support Forum. 2. Add following CSS rules to the "Custom CSS" fields in JA Builder setting panel. Feel free to ask for support on JA Builder forum if you have any question or you have any difficulty in integrate JA Builder to your website. The builder can work with all 3rd extensions like EasySocial EasyDiscuss, EasyBlog, Virtuemart, Mijoshop, etc. In this documentation, we will use EasyDiscuss as sample and you can do the same for other 3rd extensions. Download the extension and install to your Joomla site as normal. This step depends on specific extension but normally, you will create menu item and select menu type to load content from the 3rd extension. 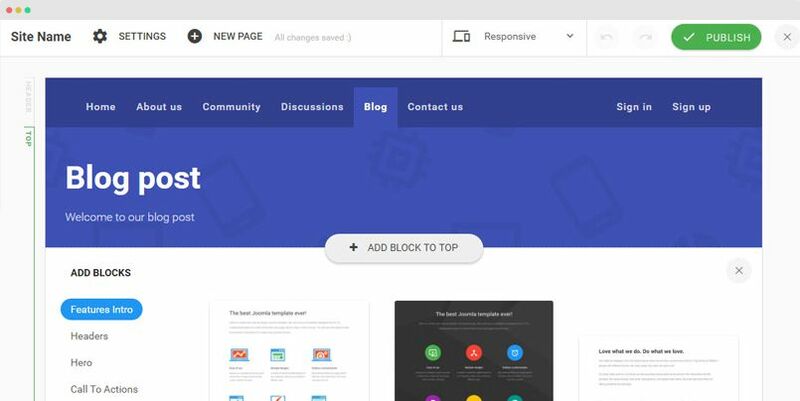 In this case, we will create a menu: EasyDiscuss » Frontpage Layout » Frontpage Layout named: Discussion to load content from EasyDiscuss component. On front-end, open the page and hit the "Edit page" button to edit the page. Duplicate a block to build multi column main content section. Change position for blocks with move left and right function in each block. You can customize style for a page or all pages by using Advanced field that allows you to add CSS rules to override styles. To do that, open the edit mode of a page then open the SETTINGS sidebar. This Page Custom Styles: Add CSS rules to the field if you want to customize style for the current page only. All Pages Custom Styles: Add CSS rules to the field if you want to customize style for all pages. You could see the changes when active mouse in other place. The CSS rules are auto saved, if you feel its okay, hit Publish button so user can see the update. Please note that, the CSS rules added to the fields will override style from builder style files. You can export the pages you created for backup or move to other sites. To do that, in the edit mode of a page, go to: Pages and export the page. You can import page that you exported or from JA Builder page library. Hit the "Pages" menu and select import page options. 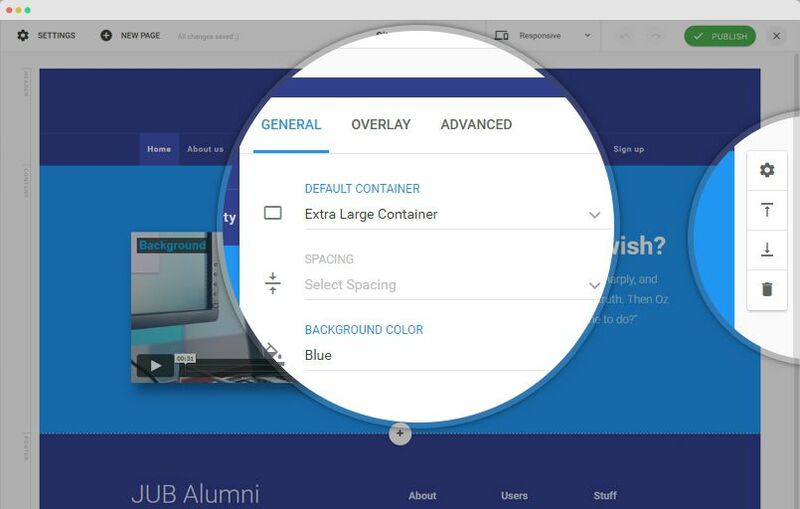 If you select to import from library, select page type and select layout to import. 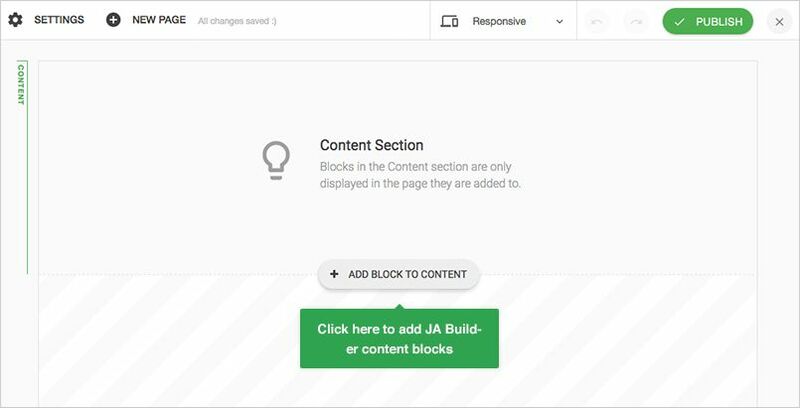 In JA Builder, you can create content block that has subcriber form that is integrated with mailchimp like Footer or Countdown content block. 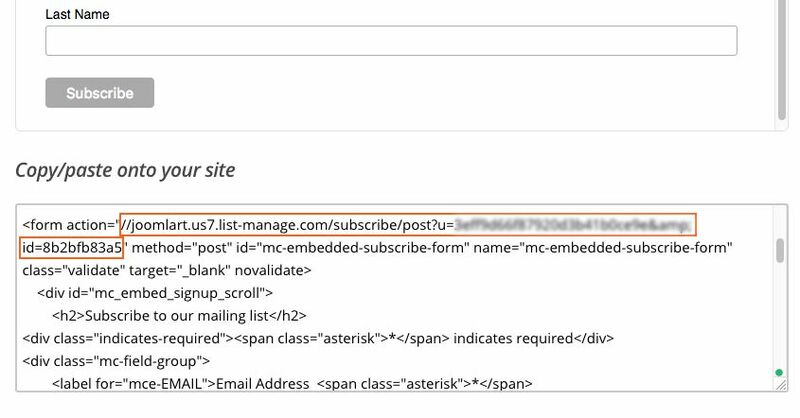 Edit the form and you will see Mailchimp API Link, insert the mailchimp form action link. Follow the instructions below to get the link. Go to https://mailchimp.com/ and sign up new account with your email. 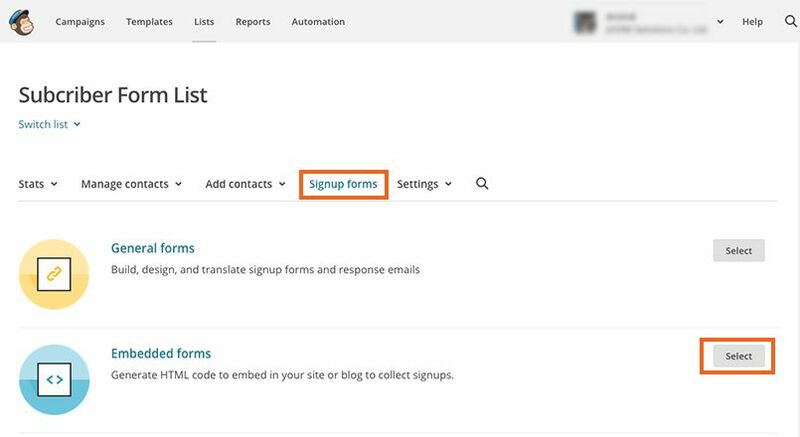 Follow Mailchimp signup instructions to complete your signup. Go to the "List" menu item on main menu and create new list. Once done, access "Signup Forms" of the list and select "Embedded forms". Now, find the form action link and copy it then paste to the subcriber form setting of JA Builder content block. JA Builder collects anonymous data comprising of server environment and Joomla versions for improvements and optimization purpose only. No personal data or site url is collected or stored anywhere on our system. Download latest package of JA Builder download page and go to your site backend >> Extensions >> Manage and install the new package, the new version will override old version. The upgrade does not affect data or settings you made. Documentation is a WIP. If you have any specific request or feedback as well as suggestions, feel free to drop us a line in JA Site builder forum. We'll try to cover them all.